Last night I smashed my 10km pb at Stockholms Stadion. 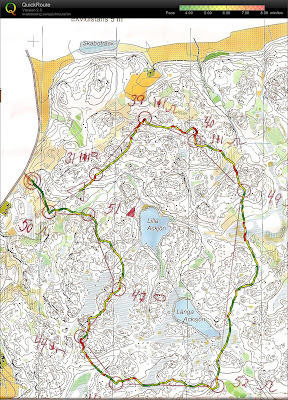 I ran 30.59,08 to finish second in the Långlöparnas Kväll. I was pretty nervous before the start as I worked out it was my first race on the track for 6 years! The last one was when I was in 6th form. I ran at the back of the lead pack for most of the race, around 5m from the front, and gradually runners dropped out or dropped away. The last 4km was just me and one other guy, and we were lapping in 74-75 seconds pretty steadily. With 4 laps left he started to ramp it up, throwing in some 73s and 72s. I managed to hold on, but be ran 70 and 65 for the last two laps and I could only manage 70 and 71 to finish 30m behind. I did manage to get under 31minutes though which I am really happy about, and I took 1.16 off my old pb. After the French 6 day I was knackered and had some problems with my thigh and my knee, so I had a week with no training - something my body really needed after WOC, Oringen and France in 4 weeks. 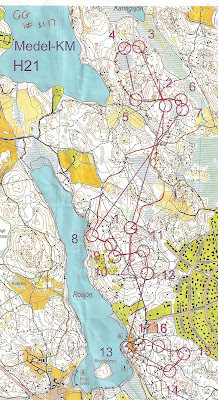 But then it was time to get back into training for the Autumn season - primarily for SM (Swedish Champs) long, middle and relay, and the World Cup Final. I will also do some running races and some of the autumn relays like 25manna. 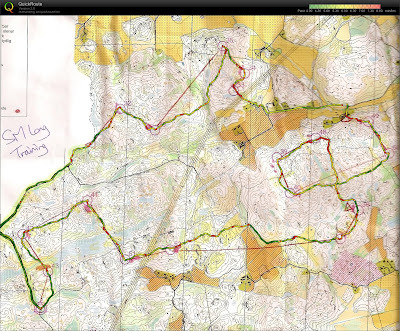 Below are some of my recent race/training maps. As you can see, some of them have colourful routes on from my new toy - I bought myself a GPS and have uploaded my routes using Quickroute. 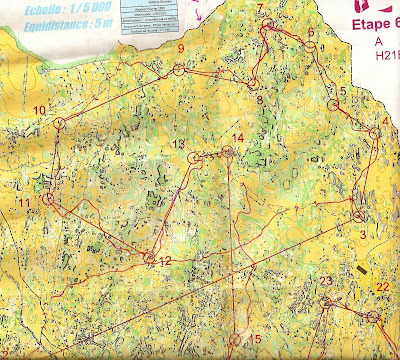 This was a really fun technical training - Started off with a line course, then 2 loops in super technical forest - really tough orienteering! This was an elite middle distance. I missed 2 minutes at the first control - d'oh! Didn't understand the map and Linus K caught me up. We ran together (not perfectly) until number 6, then I ran away from him. I ran really good after that (almost perfect) and finished 8th, 1.50 behind Fredrik L. Disappointed about the 1st control, but pretty pleased after that. This was a long distance training, I ran 3 longer intervals with some jogging between (2km, 2km and 4km). Really nice terrain relevant for SM. This was a relay training with some guys from Gothenburg. I ran quite good except the 3rd control when I lost contact about 75% along the leg and climbed up onto the wrong hilltop. Lost a couple of mins but ran well after that. This one was the club middle distance champs. I missed 30 seconds on the first 2 controls each, but after that ran almost perfectly to win by 2 minutes. 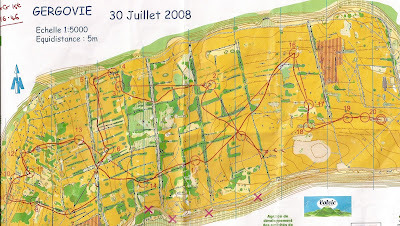 After Oringen, I went to France for a 'holiday', by which I mean I went to do 10 orienteering races in 11 days and some other running and kayaking. I flew to Paris to meet up with Pippa and Duncan who are living there at the moment, and then I had a day sightseeing before we drove down to the Auvergne. First up was a 3 day competition in Aydat, very close to where the World Cup Final was. There wasn't a high standard of competition, but the races were good, with a sprint, a long classic and a 'middle' which I won in 80 minutes. The last race especially was amazing, and one of the most enjoyable races of the year. After the 3 day, we drove down to Aveyron for the French 6 day. 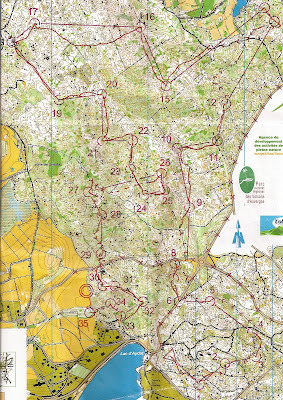 We started off getting very lost on the training map, and going kayaking near Millau. The 6 day itself had quite a lot of elite runners, including Mr Gueorgiou himself. The terrain was incredible, with fantastically detailed maps showing every bush, stone and cave. 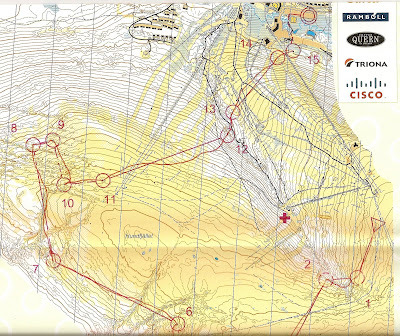 This was the kind of terrain where relocation is almost impossible, and big mistakes are very possible. 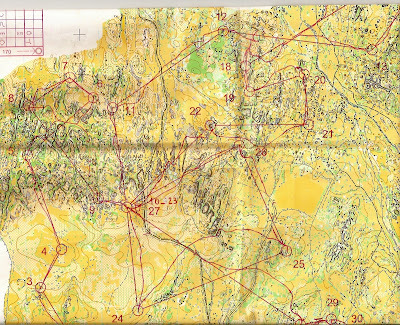 The best way to orienteer is to stay in full contact, and try to pick lines in the terrain which make that possible and easy where you can. I managed to have 3 really good days, 2 quite good days, with only one disaster on the second day. My results were 4th (9 minutes down on TG), 15th (11 mins down), 2nd (3.15 down), 6th (12 seconds down in the mass start), 5th (9 minutes down) and 3rd (4 minutes down). All the races were won in 59-66 minutes. I finished 2nd overall, but a massive 40 minutes down on TG. The last day was a chasing start, and although Oli caught me, we both caught Lucasen and I beat them in the finish. That feels nice. I didn't run to my full potential in the middle or sprint, my results were ok but not what I wanted, but I ran pretty close to perfectly in the relay, and Jon and Jamie did the rest. Now it is time to work out how I can change that into top individual results. My head and heart wasn't really in the sprint at Oringen. The long distance went well until I had some stomach cramps and was forced to walk/jog the last 3km. The middle race was really good, my best ever World Cup middle distance (13th), and I ran ok in the chase without much motivation.